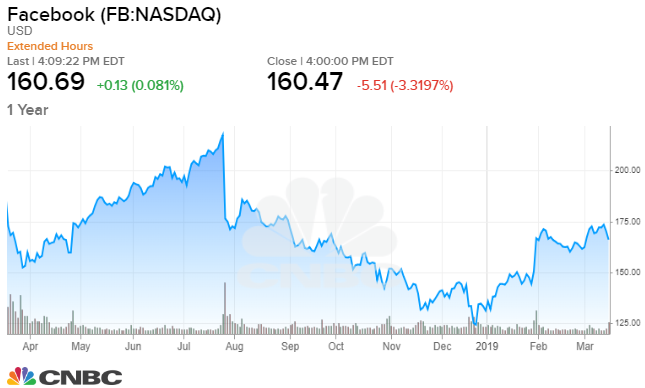 Facebook stock is now about 27 percent lower than its July all-time high, and Street sentiment — as measured by the number of hold and sell ratings — is the most bearish it's been since 2013, based on FactSet estimates. While growing skepticism can sometimes be a good contrarian indicator, Strategic Wealth Partners' Mark Tepper says to stay away from the stock, saying its ad revenue is facing a hit. "I mean it's trading at a significant discount to the S&P, but in my opinion it's for good reason," Tepper said Monday on CNBC's "Trading Nation." "They've just got an absolute ton of headwinds, like privacy, government regulation, key employee turnover. But my main concern with them is their digital advertising platform." Earlier Monday, Needham downgraded the stock to hold,citing issues including management turnover and a tougher regulatory environment. Over the last few weeks the company has announced several key changes, including high-profile executive departures and a plan for greater privacy. Teppers said Facebook was a valuable advertising platform because "they knew so much about their users and could really zero in on their ideal customers. But all that changed. Demographics are gone and their platform has been diluted." He said Alphabet is a better stock to own since the company still provides highly targeted ads that are more valuable to advertisers. "With Google, ads are being shown to people who are actually searching for something. So that makes those ads more relevant. And for advertisers, the cost per click might be lower on Facebook, but the advertisers will very quickly learn that what really matters most is their cost per new customer, and that's going to be better on Google, so I prefer Google here," he said. Over the last year, shares of Facebook have slid about 13 percent, while Alphabet has gained nearly 5 percent. Disclosure: Strategic Wealth Partners owns shares of Facebook and Alphabet.